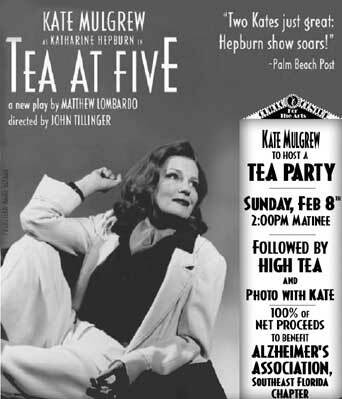 Kate Mulgrew will host "Tea Party" to benefit Alzheimer's Association, February 8th! Kate Mulgrew invites you to join her for a special High Tea on Sunday, February 8th where 100% of the net proceeds will benefit the Southeast Florida Chapter of the Alzheimer's Association. Finding a cure for Alzheimer's is a passion close to Kate's heart as her own mother has been afflicted with the disease. Please join us in this crusade! There will be a Donation Box for Alzheimer's Assocation in the Lobby. More information and a hotel special rate offer ! WEST PALM BEACH – Due to overwhelming demand, TEA AT FIVE, Matthew Lombardo’s portrait of stage and screen legend Katharine Hepburn, has been extended through February 22nd at The Cuillo Centre for the Performing Arts (201 Clematis Street) in West Palm Beach, Florida. Kate Mulgrew stars as the four-time Academy Award winner at opposite ends of her peerless career. Directed by John Tillinger. Kate Mulgrew has often been likened to Hepburn, making her the perfect choice to portray the legendary Hepburn in Tea at Five. Ms. Mulgrew’s performance of Tea at Five garnered a 2003 Outer Critics Circle Award nomination for Outstanding Solo Performance and a 2003 Lucille Lortel Award nomination for Outstanding Actress. Tea at Five is an intimate look at Katharine Hepburn at home in her Fenwick estate in Old Saybrook, Connecticut. The first act takes place in September 1938; the second act takes audiences to February 1983, when the now-legendary star reflects on the triumphs of her career and her great love affair with Spencer Tracy. Matthew Lombardo’s play reveals Hepburn as an undeniable talent that is equal parts witty and fiery, and one of the twentieth century’s greatest film stars. Tea at Five is presented by Daryl Roth, David Gersten, Paul Morer, Michael Filerman, Amy Nederlander and Scott E. Nederlander. Tea at Five continues at the Cuillo Center through February 22nd. Performances are Tuesdays at 8 PM, Wednesdays at 2 PM & 8 PM, Fridays at 8 PM, Saturdays at 2 PM & 8 PM and Sundays at 2 PM. There are no performances on Mondays or Thursdays. Regular tickets are $42; senior discounts, matinees only, are $39.50. Groups of 10 or more are $35 each. To purchase tickets, call (561) 835-9226. Don't forget to mention you saw the info on Totally Kate!